In my Garden Scissors posts, I share projects I am working on in my three acre woodland property in Chagrin Falls, Ohio on the banks of the Chagrin River. We’re just steps away from some of the 23,000 acres and 270 miles of trails of Cleveland Metroparks nature preserve. We moved here almost 10 years ago and have since re-landscaped the entire yard. Except for the hundreds of maples and oaks, we have literally planted every bush and flower here with our own hands. There is always a lot of work to be done to keep up this yard. We take pride in every job whether it’s re-designing a corner of my perennial garden, dividing astilbe, pruning the wisteria or even just spreading mulch and picking weeds. Learn with me as I strive to become a better gardener while I provide my own insight and time-saving tips. I will share ideas for solving garden and landscape challenges, information about some of my favorite plants and inspiration for your own yard and garden. We’ll take a trip just down the road to Amish country to my friend Clara’s Perennial Post, we’ll walk the fields with local vegetable farmers and we’ll talk with the experts at my favorite local garden center. 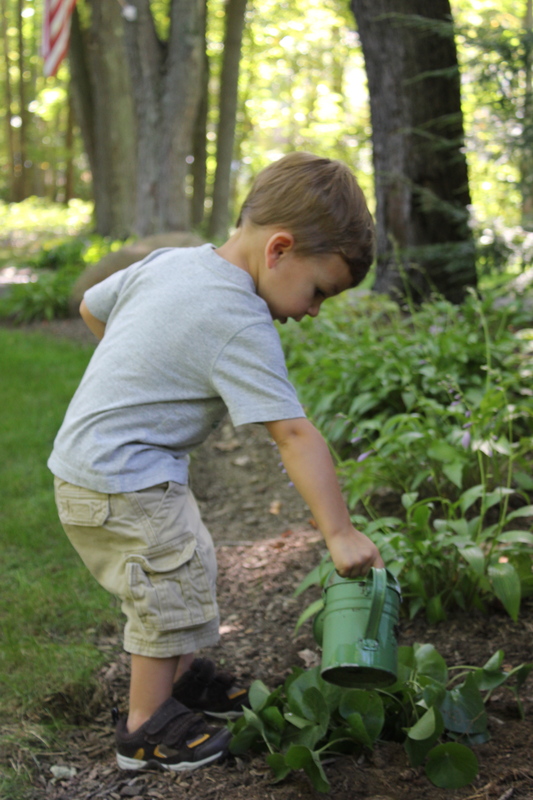 I’ll also share ideas for getting your children involved and instilling in them a love of gardening and nature, as I’m almost always completing my gardening tasks with my kiddos nearby. One of these days I plan to finally create a children’s vegetable and herb garden with my kids. We’ll use the fresh vegetables to make incredible meals together. We’ll go on nature walks in the preserve across the street and around Northeast Ohio where we’ll look for inspiration for our woodland garden, hunt for wildflowers, walk in the river and search for forest animals. I’m a self-professed photography nut and I’m commonly running to grab my camera to catch a shot of the fox or coyote in our yard, the butterfly on my hydrangeas or the eastern bluebird on my feeder. In my Garden Scissors section I will show you who we’ve discovered out our window today.